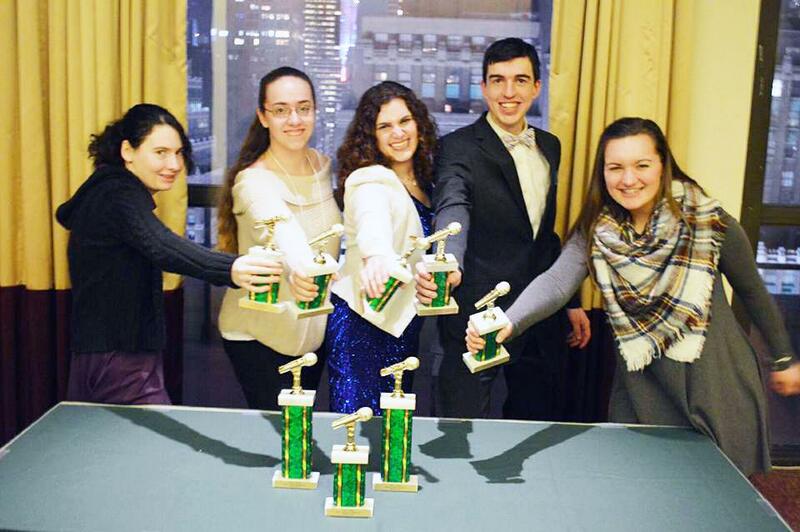 Gannon University’s award-winning radio station, 90.5 WERG, is running out of space for its trophies after new wins. After competing against nearly 1,000 other schools, WERG was nominated for – and won – several national awards from the Intercollegiate Broadcast System’s (IBS) 77th annual media conference that was held March 3-5. Chet LaPrice, the station’s operations manager, and five student representatives traveled by train to attend the three-day conference that was held in New York. The station was nominated for 10 national award categories at this year’s conference. WERG took home two national championship awards and eight top-five national finalists awards. “What am I most proud of?” LaPrice pondered. “Well, you’re looking at it. “When I walk in here and I see someone on the air, somebody in the production booth, people at both production stations and students sitting at the table, the atmosphere feels like a professional broadcast facility. 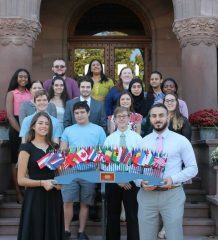 WERG has won around 28 national awards in total and is now running out of room to showcase its accomplishments. WERG once again demonstrated its skills by returning from the IBS conference as a top-five finalist for the “Best Station at a University with Under 10,000 Student Enrollment.” This is the third consecutive year the station received this award. Other awards included Best Promo Series, Event Promo, Station Imaging, Play-by-Play and Station Contest/Promotion. Allie Leng, WERG’s promotional manager, received two national championship awards for her promotions. The first award was for best station imaging. She won with her “Not Pre-Recorded” after hours station liner. The second was for Best Event Promo. The winner was “Win Tickets to the Panic at the Disco Concert” promo. This was a collaboration project with Lauren Sovisky, WERG’s production manager. Tom Barton, the station’s general manager, was another trip attendee who took something home with him – he is now one of the top-five best station managers in the nation. “It was awesome really; just the fact that I was nominated was a huge honor and then being a finalist was really just a confidence booster more than anything else,” Barton said. Because there were over 13,000 attendees – and over 140 awards to be handed out – the ceremony was slightly hastened. This did not change the excitement the station representatives felt. LaPrice also received an award for Best Training Manual and had the opportunity to be the national speaker on four separate panels. LaPrice said there were about 30 to 40 panels held each day and topics included everything from programing your station, to marketing, to management style and techniques. Leng and Sovisky had the opportunity to be one of the few groups of students at the conference to host their own panel. Their topic pertained to the creative aspect of production as well as techniques. They discussed their process to show other stations ways in which they could be more creative and mix things up. Leng said approximately 40 to 45 representatives attended their panel — even with standing-room only. One of the topics they covered was effective copywriting. LaPrice said that copywriting does not appear to be taught at most schools, so, “Everybody at that panel ate up everything” that they said. Of all the panels, there were only three or four student-run panels, Leng said. Barton also had the chance to attend several panels at the conference. One of the most interesting panels he attended was a sports talk-radio lecture that included a tour of a radio station’s headquarters and control room. Leng said she also enjoyed the trip.